This is the beginning of a new politics that says moments of silence must be replaced with moments of action. Baldwin gave voice to the emerging determination of congressional Democrats (and perhaps even a few Republicans) to end the charade of silence and ceremony that has been used by the National Rifle Association and its minions in the House and Senate to stymie honest debate and necessary action to address mass killings. But this week it was different. Murphy did not stand alone. As the Senate convened following Sunday’s massacre of 49 people at an LGBTQ nightclub in Orlando, the senator announced on Twitter: “I’ve had #Enough!” Murphy interrupted the regular business of the Senate at 11:21 am Wednesday and declared: “I am prepared to stand on the Senate floor and talk about the need to prevent gun violence for as long as I can.” Initially a handful of Democrats joined him, including New Jersey Senator Cory Booker, who said, “I’ve cleared my entire day. 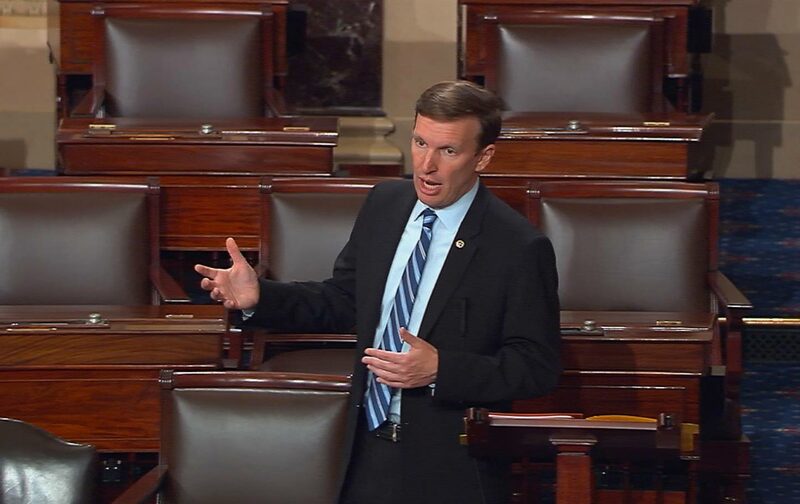 I’ve cleared my evening events…so I can stand on this floor and support Senator Murphy.” Eventually, dozens of Democratic senators would join Murphy on the floor, while millions of Americans were following the filibuster on C-SPAN and social media (hashtags: #Enough, #filibuster, #DisarmHate). It was a small signal: a commitment by Republican Senate leaders to permit votes on amendments to expand background checks and ban gun sales to suspected terrorists. Most members of the Republican majority are expected to oppose the amendments. It is true that, in this election year, the prospect of Senate votes allows for a focusing of energy by citizen lobbyists against gun violence, and perhaps by Democratic challengers to Republican incumbents. But even that may not be enough to move a sufficient number of GOP senators to take the action Americans demand. And there is still the matter of a Republican-controlled House, where Democratic members had to shout from the floor Monday night in order to be heard over Speaker Paul Ryan’s wall of silence. But it is foolish to fret about the political hurdles. They must be overcome. And, toward that end, congressional Democrats have made a historic pivot. They are not allowing the Republicans to maintain the charade of silence that has prevented debate on gun violence. That has the potential, not the certainty but the potential, to open up a gun debate that for too long has been stifled. The vital importance of ending the silence was illustrated by Baldwin. Standing in solidarity with Murphy on the floor of the Senate, the Wisconsin Democrat spoke eloquently about “the nexus of hate and terror and easy access to weapons of war by people who should not have them.” Then, the chamber’s only openly LGBTQ member spoke in measured yet strikingly powerful language of the 49 people who on Sunday morning died at that nexus. On Friday, this last Friday, I had the honor of going to the opening ceremonies at Milwaukee, Wisconsin’s PrideFest. They were celebrating their 30th year of PrideFest. In preparing for what I was going to say at that opening ceremony, I reflected on how different things were 30 years ago in 1986. That was actually the year I was first elected to local office. And I didn’t have a lot of colleagues who were in the LGBT community in America, let alone the world at that point in time. And, boy, we have changed. We have seen such progress. But after celebrating the opening of PrideFest in Milwaukee, I woke up on Sunday morning, as we all did, to this horrific, horrific tragedy in Orlando. A hate crime is a crime that targets a particular audience, a particular group in order to send terror throughout that community, not just the victims but all who share characteristics with the victims, and in a month, June, which is Pride Month, to usually celebrate how far we have come over oppression, over discrimination, over hate crimes, to wake up and see this was truly unspeakable. With a board featuring images of those who were slain at Orlando’s Pulse nightclub, she read the names and told the stories the dead. Baldwin spoke slowly, yet warmly, offering biographical details and anecdotes about LGBTQ Americans, their friends and their allies, telling us about people served their country, served their community, loved their families and their partners, loved to dance. This is not the end of anything. This is beginning of a new politics that says moments of silence must be replaced with moments of action.